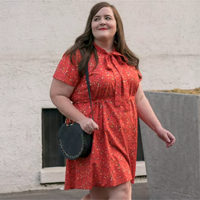 Aidy Bryant "knew going in that this was going to be a struggle," costume designer Amanda Needham says of dressing the actress for her Hulu series. But Needham didn't expect to have to create nearly all of Bryant's Shrill wardrobe herself -- outfits described as a "plus-size dream." "This is the hardest thing for me right now — answering all these questions from people reaching out to me on Instagram, wanting to know where they can buy these things," says Needham. "It really underscores the message that the fashion industry needs to start catching up. Truly, designing this show would have been impossible to do off the rack. You actually cannot create a look for a plus-size character without a tailor and the resources to create customized pieces for their body. Because the retail stuff — it doesn’t seem like it’s plus-size people designing them. It’s like they’re guessing what a plus-size body is shaped like. There’s no attention to detail, and once you get past a certain size, it really seems like the designers are ... uncomfortable with those bodies. There’s so much shame around weight, I’ve realized, and we’ve got to get rid of it. I want the industry to just celebrate whatever size we are and work with it. It’s like, stop building tents and caftans for anyone over a size 14." Needham adds: "I’m hoping Shrill lights a fire under people and starts opening things up, because I would love to be able to put off-the-rack clothes on Aidy for the second season. ALSO: Needham breaks down Bryant's outfits from Season 1.